GRAND RAPIDS February 19, 2015– Federal legislators have introduced a bill that is bad for democracy and bad for America. The Fast Track legislation (S. 1900 and H.R. 3830), introduced by Sens. Max Baucus (D-Mont.) and Orrin Hatch (R-Utah) and Rep. Dave Camp (R-Mich.), would establish a process that allows no amendments and limited debate on such trade deals as the Trans-Pacific Partnership (a free trade with Pacific nations). Once legislators have the Fast Track ticket in their hands, they are free to agree to provisions that will send jobs overseas, reduce the bargaining power of workers, jeopardize health and safety regulations and gives corporations more control over our economy and our trading partners’ economies. As Congress inches closer to a vote on this anti-labor legislation, west Michigan labor leaders are stepping up their opposition. Sen. Gary Peters sat down with west Michigan union leadership on Tuesday, and Fast Track legislation was a big topic of discussion. Sen. Peters assured the two dozen union leaders at the Kent-Ionia Labor Center that he stands opposed to the legislation, and that this isn’t strictly a Democratic versus Republican issue. President Barack Obama supports the legislation, while many Democrats in Congress are against it. Sen. Peters pointed out that this isn’t even a labor versus business issue, saying that one of the most vocal opponents to this legislation is Ford Motor Company. This isn’t the first time bad trade legislation has allowed bad trade deals to materialize. 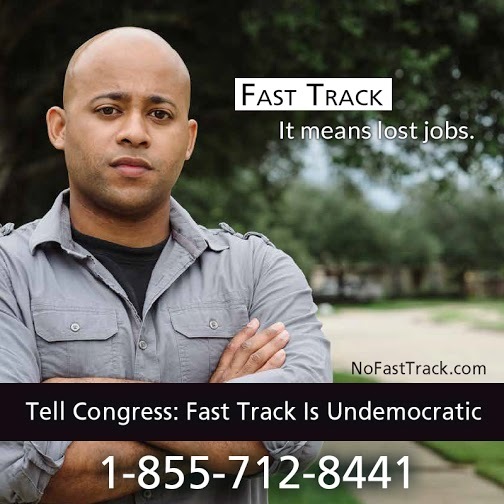 Fast Track legislation allowed the North American Free Trade Agreement (NAFTA) to be rammed through Congress with weak labor and environmental side deals. Since NAFTA went into effect in 1994, North American workers have experienced downward pressure on wages and a tougher organizing environment. Twenty years later, we find an unbalanced system in which profits soar even as workers take home a diminishing share of the national income. To really have trade deals with high standards, the American public must have more say—and that means no Fast Track authority from Congress. The Baucus-Hatch-Camp- bill would do nothing to fix the U.S. trade deficit or grow the middle class. In fact, it would interfere with important health and safety regulations, ensure the primacy of investor rights over labor rights and boost profits and incomes for global corporations and the top 1%. But it will shrink the paychecks of working families and make it less likely that America’s children can climb the ladder of success. In response to the pending vote on the Baucus-Hatch-Camp Fast Track legislation, the Kent-Ionia Labor Council passed a resolution at its monthly meeting this week, opposing its passage. Reform failed trade policies that have cost American jobs, devastated manufacturing communities, and impinged on traditional state powers. This entry was posted on February 19, 2015 by WMALC in Political news and tagged Barack Obama, Dave Camp, Democrats, Gary Peters, Max Baucus, Orrin Hatch, trade.